Barcode Bazar is authorised sellers of wide range of Ferrule Printing Machines in India, Barcode Bazar deals in Canon Ferrule Printing Machine’s and Max Letatwin Ferrule Printing Machine. You can also get all Ferrule printing consumables from Barcode Bazar.. The MK2500 prints precise characters of up to 300dpi for tubes, labels and more. 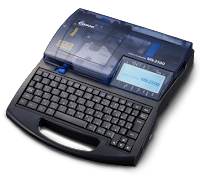 With a large LCD display and automatic full and half-cutting, it offers smooth and easy printing from start to finish.